Cambridge Mask Competition - Winning Design! 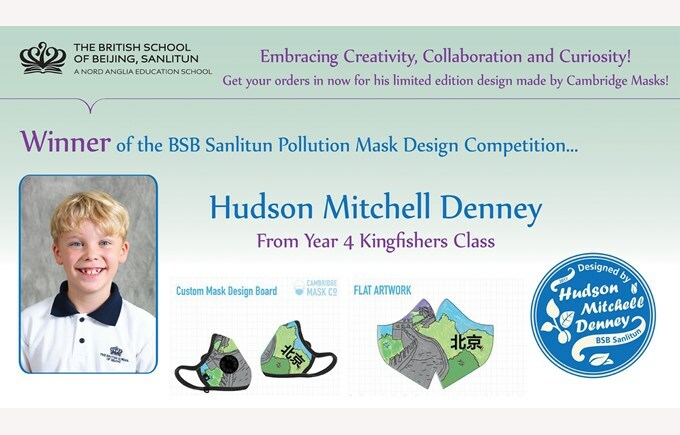 Earlier in the year we launched a special competition in partnership with The Cambridge Mask Company for the children to design their very own pollution mask. This competition ran alongside our MIT challenge, in which the children learnt more about their local environment and tried to solve the problems that face us in Beijing. We had hundreds of entries from Pre-nursery to Year 6 and last term we announced the top 20 designs which were on display in our lobby area. There were so many amazing designs it was very tricky to even choose a top 20. We certainly have some extremely talented artists in this school! HUDSON DENNEY from Year 4 Kingfishers! Hudson’s design was fantastic and I can see exactly why Cambridge Masks chose his mask design, featuring the Great Wall of China. It immediately makes you think of Beijing and his Chinese characters on the design also makes the mask super special and it really stands out. Well done to Hudson for his phenomenal design - soon all of his friends and family will be able to wear his art work, how cool! An order form has gone home today in the children’s bags so if you would like your very own mask created by the talented Hudson, get your orders in fast to avoid disappointment! There are a very limited number of the masks available and they are only being sold exclusively at BSB Sanlitun.